Ferragamo wholesale fragrances are the offer, that we have decided to share with You today. The stock of these wholesale perfumes is available from Italian wholesaler. The wholesaler is offering 1000 pcs of Ferragamo wholesale fragrances shown in the picture below. 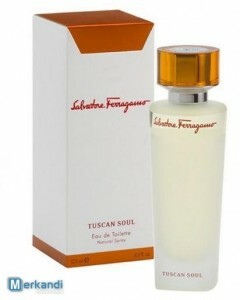 As You can see, these are Feragamo Tuscan Soul 125 ml wholesale fragrances. The wholesaler informs all potential buyers, that the best unit price will be given to this person, who will decide to take the whole available stock. If the quantity is too big for You, then You can contact the wholesaler and ask about the smaller amount, as he did not mention the specific number.